Alien: Covenant is definitely a return to form for Ridley Scott. 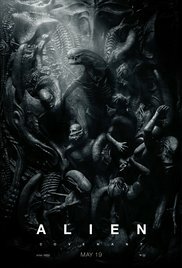 Although I enjoyed Prometheus, it didn't really have an Alien feel, whereas this one does seem closer to the original trilogy in terms of pacing and plotting. As with Prometheus, though, this is absolutely Michael Fassbender's film. In Prometheus I remembered none of the characters' names, aside from David8. This time, I am writing the next day and still recall two or three of the crew, but it is Michael Fassbender's performance that really stands out--and I'm not just saying that because he's a long-time favourite actor of mine. David8 is what makes this film, as he did the one before. He's so deliciously creepy and yet completely compelling. I am intrigued to see what will happen in the final movie, to link us back to the original. All in all, this was suspenseful, enjoyable, and worthy of repeat viewing. I look forward to the DVD release so I can experience Michael Fassbender's double performance again.